City of Refuge Ghana (CORM) is something I feel anyone with a heart to serve should experience. I went planning to help them without realizing just how much they would help me grow into an even deeper relationship with Christ. I will never forget this experience. Here are four tips to help you if you are thinking about serving with an Adventures team to CORM in the future. The amount of ground needing to be tilled at CORM Ghana is greater than any small group of hands could ever manage during a short-term missions trip. By that I mean the need is great. From the time you awake until the time everyone begins to slow down for the evening, there are numerous ways for me to serve. The bulk of our team arrived on a Friday night which was movie night for the kids. I was beyond exhausted from traveling more than 16 hours to get there, and every part of my being wanted to just hop in the shower and climb into bed. However, there was no way I could ignore the excitement on those beautiful little faces. It was obvious the kids looked forward to movie night all week and really wanted us to join them so, I happily took a seat on the floor and was immediately surrounded by three little girls. Throughout the movie, they asked about my occupation, home, family and more. We giggled together as they twirled their fingers in my locs and asked me questions about parts of the movie they didn’t understand. It was the perfect start to our time at CORM! Be willing to push through your emotions (and your jet lag) to begin making a connection with the students early. This was not my first missions trip, but the first structure in this way. My previous missions trip was with a group of nurses, pharmacists, and nurse practitioners and the schedule was very precise. Our schedule was thoroughly mapped out each day and there wasn’t much down until the end of clinic. Serving at CORM was completely different in the best way! There were a few tasks we were asked to help with that absolutely needed to be done, but most of the time we were able to just float to wherever we were needed. The first day of serving at Faith Roots International School we began the day all together as we helped some of the children make thank-you cards for their sponsors. But the rest of the week was basically a “get in where you fit in” kind of vibe that I loved! There were moments where I simply walked into the library and asked, “What do you need me to do today?” and the offer to assist was always welcomed. Walk into the kitchen as ask if anyone needs help cleaning up after a meal, ask one of the teachers if you can help the students with any assignments, or grab a broom and help clean at the end of the day. A few people have told me they want to go on a missions trip one day, but aren’t sure exactly how they could serve. Well...how do you serve others at home? I’m a web designer and social media manager. So, one day I helped my bestie and our team leader Jennifer Lucy Tyler update the CORM Ghana Instagram page and create a plan for their new #SheIs campaign. Then, I was able to create an online shop for the women in their City of Refuge Empowerment (CORE) program so people can purchase these beautiful, handmade items from the U.S. I had the opportunity to lead some of the long-term missionaries in a few Holy Yoga classes while we were there. Everyone said they really enjoyed the time to slow down before getting into the busyness of the day. 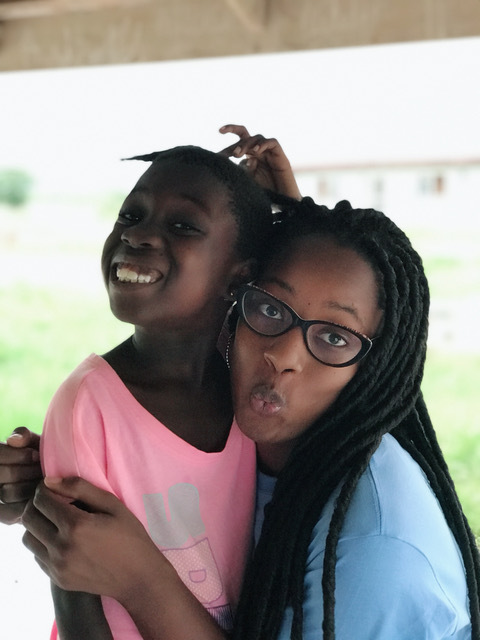 Though those of us who travel with Adventures in Missions to CORM Ghana are only there for a short time, there are others there who have dedicated years of their lives to serving God’s children abroad. They often forget to take time to care for themselves as their hearts are so focused on caring for everyone at City of Refuge. I was beyond honored serve them in this way. The presence of God is thick at CORM Ghana. His hand is clearly on this place. Our team met every morning after breakfast and every evening before bed to go over a particular scripture our team leader had chosen. Blanketing our service in God’s word really helped us stay focused on the true purpose of our visit: to be His hands and feet. If your team leader doesn’t orchestrate these, Adventures In Missions also provided a wonderful devotional book that I journaled in before started each day. It was short and to the point and always connected the Word to serving in the missions field. Be sure to listen and participate if you’re able to attend a church service or worship night while you’re there. Sing, dance, smile, laugh and celebrate God’s provisions for His CORM children. For information on the next trip to CORM Ghana led by Jennifer Lucy Tyler, please contact her here. To send donations to CORM Ghana to help them continue their mission to save children in the area, CLICK HERE. To get an in-depth look at the life of many of the children who are benefiting from CORM, CLICK HERE.